By 1928, the art of the silent film was at its height. Many of the best directors were understandably, though not justifiably, sorry to witness the disappearance of this perfect world of images. They felt that the cinema, having taken a certain aesthetic direction, had become an art that was supremely suited to what was known as the ‘exquisite unnaturalness’ of silence. The realism of sound was bound to upset matters. In fact, now that the use of sound has satisfactorily proved that far from annihilating the Old Testament of the cinema it has brought it to fulfilment, one might well ask oneself if the technical revolution that resulted from the introduction of sound could really be called an aesthetic revolution. In other words, did the years 1928-30 really witness the birth of a new cinema? As far as the way a film is put together is concerned, the history of the cinema does not in fact reveal as marked a difference as one might expect between the silent and sound cinema. There are many affinities to be found between certain directors of the 1920s and others of the 1930s and especially the 1940s – between, for instance, Eric von Stroheim and Jean Renoir or Orson Welles, Carl Theodor Dreyer and Robert Bresson. These more or less marked affinities prove first of all that the dividing line of 1930 was no barrier, that certain qualities of the silent cinema were carried over into the sound era, but above all that instead of contrasting ‘sound’ with ‘silent’ films we should examine in what way they differed from and resembled each other in conception and style. I am quite aware that the brevity of this essay will oblige me to make some critical simplifications, and I shall regard what I put forward more as a working hypothesis than an objective truth. With this in mind, I would say that by and large there were too opposing schools in the cinema from 1920 to 1940: directors who believed in the image and those who believed in reality. By 'image', I mean in a general sense anything that can be added to a depicted object by its being depicted on the screen. This addition is complex, but it can be traced back to two factors: the plasticity of the image and the resources of editing (in other words, the organisation of images in time). By plasticity I mean the style of the sets and the make-up, to a certain extent even the acting, and of course the lighting and framing which complete the composition. 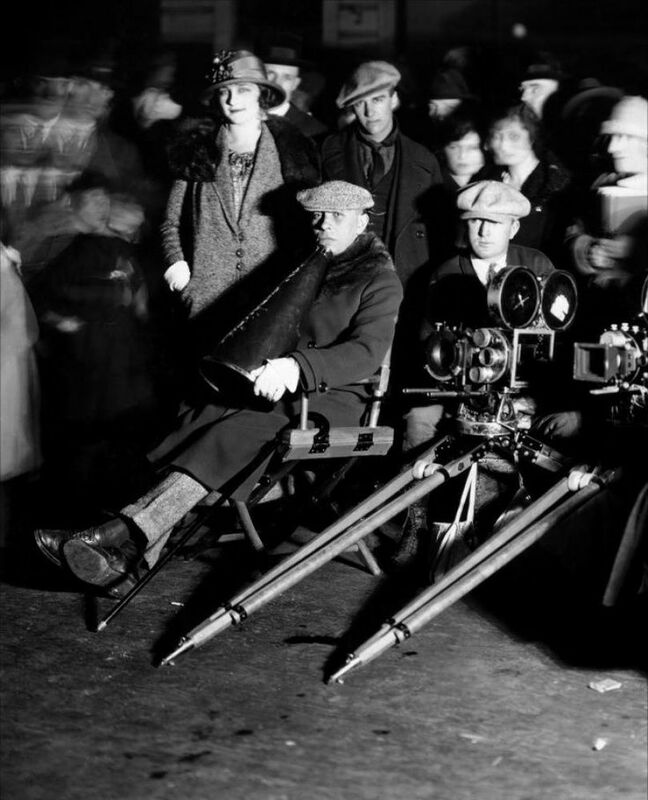 As for the editing, which, as is well known, had its source in D.W. Griffith's masterpieces, Andre Malraux wrote in The Psychology of the Cinema that it constitutes the birth of the film as an art: editing is what truly distinguishes it from simple animated photography and makes it a language. The use of editing can be 'invisible'; and this was most frequently the case in the classical pre-war American film. The only purpose of breaking down the shots is to analyse an event according to the physical and dramatic logic of a scene. The analysis is rendered imperceptible by its logicality. The spectator's mind naturally accepts the camera angles that the director offers him because they are justified by the disposition of the action or the shifting of dramatic interest. But the neutrality of this 'invisible' breakdown of sequences does not take into account the full possibilities of editing. These are to be found in three devices generally known as 'parallel editing', 'accelerated editing' and 'editing by attraction'. In creating parallel editing, Griffith managed to evoke the simultaneity of two widely separated actions, by a succession of shots of first one, then the other. In La Roue (The Wheel), Abel Gance creates the illusion of an accelerating locomotive without having recourse to any real images of speed (for all we know, the wheels might as well be revolving on the spot), simply by an accumulation of shorter and shorter shots. 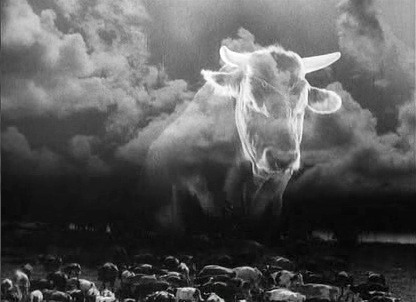 Finally, editing by attraction, conceived by Eisenstein and more difficult to describe, might be broadly defined as the reinforcement of the meaning of one image by another image which does not necessarily belong to the same action: for instance, the cascade of light, in The General Line, which follows the shot of the bull. In this extreme form, editing by attraction has not been used very frequently, even by its originator, but the much more general practice of ellipse, comparison or metaphor is basically very similar: for instance, stockings thrown onto the chair at the foot of the bed, or even spilt milk (in Henri-Georges Clouzot's Quai des Orfevres/Jenny Lamour). Naturally there exists various combinations of these three devices. But whatever they are, they have a common recognisable feature (which could serve as the very definition of editing): the creation of meaning which is not contained objectively in the individual images themselves, but which arises from their collocation. Lev Kuleshov's famous experiment with the same shot of Ivan Mozhukhin, whose smile seemed to change in implication according to the shot that preceded it, is a perfect summary of the properties of editing. Kuleshov, Eisenstein and Gance do not show the event through their editing; they elude to it. True, they take most of their elements from the reality they are supposed to be describing, but the final meaning of the film lies much more in the organisation of these elements than in their objective content. 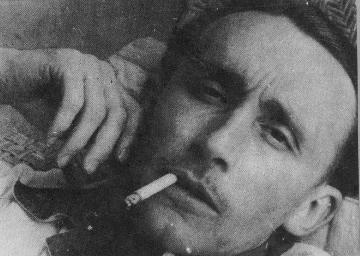 The substance of the narrative, whatever the realism of the individual shots, arises essentially from these relationships (Mozhukhin smiling plus dead child = pity); that is to say there is an abstract result whose origins are not to be found in any of the concrete elements. In the same way, one could imagine that young girls plus apple trees in blossom = hope. The combinations are innumerable. But they all have one thing in common: they suggest an idea by means of a metaphor or an association of ideas. And so between the scenario proper - the ultimate object of the narrative - and the raw image, a supplementary link is inserted, a kind of aesthetic 'transformer'. The meaning is not in the image, but is merely a shadow of it, projected by the editing on the consciousness of the spectator. To sum up: both the visual content of the image and the possibilities of editing mean that the cinema has at its disposal a whole arsenal of devices with which it can impose its own interpretation of a depicted event on the spectator. By the end of the silent era, one can consider this arsenal to have been complete. The Soviet cinema took the theory and practice of editing to their ultimate conclusions, whereas the German expressionist school subjected the plasticity of the image (sets and lighting) to every possible distortion. The German and Soviet cinemas were certainly not the only important schools at the time, and one could hardly claim that in France, Sweden or America, film language lacked the means to say what it had to say. If the essence of cinematic art is to be found in all that plasticity and editing can add to a given reality, then the silent cinema was a complete art. Sound could have played only a subordinate and complementary role, as a counterpoint to the visual image. But this kind of potential enrichment (which at the best of times could only have been minor) would have paled beside the whole range of supplementary reality that was in fact introduced by sound. What we have done is to suppose that expressionism in the editing and the image is the essential part of film art. It is precisely this generally accepted notion that is implicitly challenged, as early as the silent era, by directors such as Erich von Stroheim, F.W. Murnau or Robert Flaherty. Editing plays practically no role at all in their films, except in the purely negative sense of eliminating what is superfluous. The camera cannot see everything at once, but at least it tries not to miss anything of what it has chosen to see. 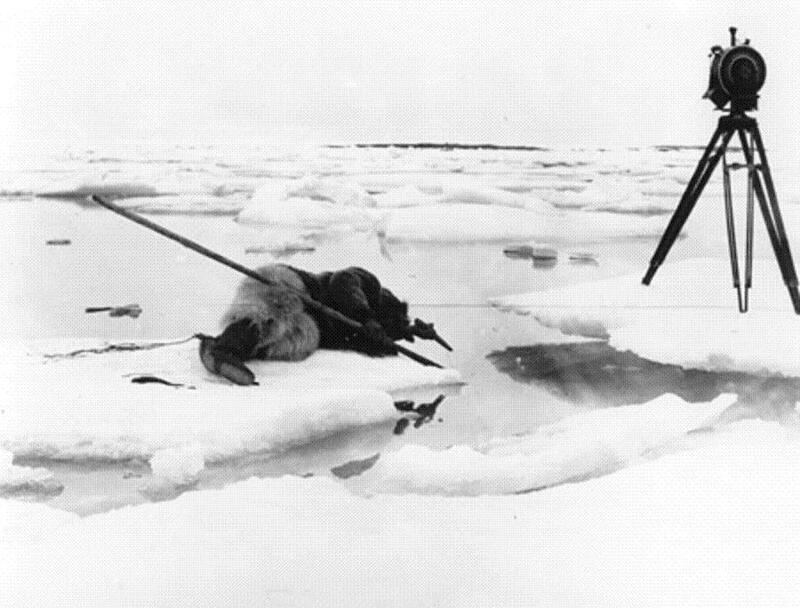 For Flaherty, the important thing to show when Nanook is hunting the seal is the relationship between the man and the animal and the true proportions of Nanook's lying in wait. Editing could have suggested the passage of time; Flaherty is content to show the waiting, and the duration of the hunt becomes the very substance and object of the image. In the film this episode consists of a single shot. Can anyone deny that it is in this way much more moving than 'editing by attraction' would have been? Murnau is less interested in time than in the reality of dramatic space: in neither Nosferatu nor Sunrise does editing play a decisive part. One might perhaps suppose that the plasticity of Murnau's images has an affinity with a certain kind of expressionism; but this would be a superficial view. The way Murnau composes his images is not at all pictorial, it adds nothing to reality, it does not deform it; rather it strives to bring out the deeper structure of reality, to reveal pre-existent relationships which become the constituents of the drama. Thus, in Tabu, the entry of a ship onto the left of the screen makes the spectator see it as a metaphor of fate, without Murnau in any way distorting the strict realism of the film, shot entirely on location. But it was without doubt Stroheim who was the most reluctant to use visual expressionism and editing devices. In his work, reality admits its meaning like a suspect who is being grilled by an indefatigable police inspector. The principle of his direction, a simple one, is to look at the world from so close and with such insistence that it ends up by revealing its cruelty and its ugliness. One can well imagine, in theory, a Stroheim film composed of a single shot, which would be as long and as close up as one liked. I do not want to limit my case to these three directors. We shall certainly find others, here and there, who reject expressionistic elements and do not rely on editing to play a large part. Even Griffith is one of them, for example. But perhaps these examples will suffice to show that in the middle of the silent period there existed a film art that was diametrically opposed to what is normally thought to be true cinema, a language whose syntactic and semantic components are not at all the individual shots: the images are important not for what they add to reality but for what they reveal in it. The silent cinema could only counteract this tendency. Both Stroheim's Greed and Dreyer's La Passion de Jeanne d'Arc (The Passion of Joan of Arc) are virtually sound films. Once editing and visual composition cease to be considered as the very essence of film language, it can be seen that the arrival of sound was not an aesthetic watershed dividing two radically different aspects of the medium. Some people saw that sound was bringing a certain kind of cinema to an end; but this was not at all the cinema. The true cleavage plane was elsewhere; it was, and still is, cutting clean across thirty-five years of the history of cinematic expression. Now that the aesthetic unity of the silent cinema is not as solid as it seemed, caught as it is between two strongly contrasting tendencies, we should perhaps take another look at the history of the last twenty years. From 1930 to 1940, a certain kinship of expression in the cinema grew up throughout the world, originating in particular from America. Hollywood was riding high with five or six well-tried types of film which gave it overwhelming superiority: the American comedy (Mr Smith Goes to Washington, 1939), the burlesque film (the Marx Brothers), the song-and-dance musical (Fred Astaire and Ginger Rodgers, Ziegfeld Follies, 1945), the gangster film (Scarface, 1932, I Was a Fugitive from a Chain Gang, 1932, The Informer, 1935) the psychological and social drama (Back Street, 1932, Jezebel, 1938), the horror film (Dr Jekyll and Mr Hyde, 1931, The Invisible Man, 1933, Frankenstein, 1931), the Western (Stagecoach, 1939). 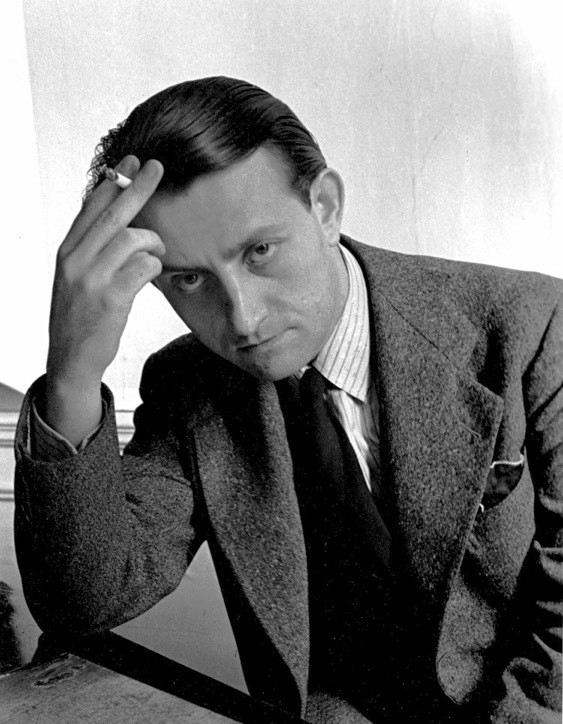 During the same period, the French cinema was undoubtedly the next best after the American: its quality gradually emerged in the trend which might broadly be termed 'noir realism' or 'poetic realism', and which was dominated by four directors: Jacques Feyder, Renoir, Marcel Carne and Julien Duvivier. As it is not my purpose to award prizes, there would not be much point in lingering on the Soviet, British, German and Italian films of this period, which were relatively less important than they were to be during the following ten years. In any case, the American and French films will suffice to demonstrate clearly that the pre-war sound cinema was an art that had visibly reached well-balanced maturity. A word about content first of all: there were the well-tried genres, governed by carefully worked-out laws, capable of entertaining the largest possible international public, and also of attracting a cultivated elite, as long as these felt no a priori hostility towards the cinema. As for form, the photographic and narrative styles were perfectly clear and they conformed with their subject: a total reconciliation of sound and image. 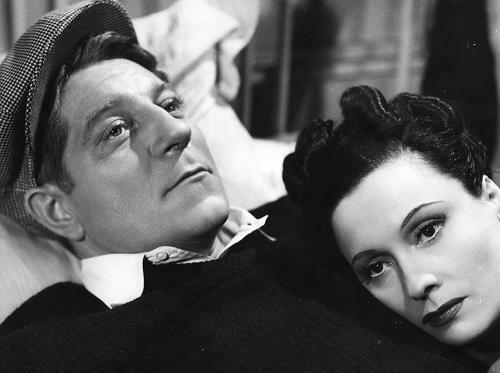 When one re-sees films like William Wyler's Jezebel, John Ford's Stagecoach or Carné's Le Jour se lève (Daybreak) today, one senses an art that has attained a perfect balance, an ideal form of expression. Conversely, one admires dramatic and moral themes which, although not entirely creations of the cinema, were raised to a certain nobility, to an artistic effectiveness that they would not have achieved without it. In short, these were all characteristics of 'classic' art in full flower. I am perfectly aware that there is a case for maintaining that the originality of the post-war cinema, compared with that of 1939, lies in the emergence of certain individual countries as film-producers, especially in the dazzling explosion of the Italian cinema and the appearance of a British cinema that was original and free from influences from Hollywood; that the truly important phenomenon of the 1940s was the infusion of new blood, the opening up of unexplored regions; that the real revolution took place more on the level of subject-matter than of style, and concerned what the cinema had to say to the world rather than the way of saying it. Is not neo-realism above all a kind of humanism rather than a style of direction? And is not the essential feature of this style self-effacement before reality? It is certainly not my intention to champion some supposed superiority of form over content. 'Art for art's sake' is just as heretical in the cinema as it is elsewhere, perhaps even more so! But new wine should not be put into old bottles! And one way of understanding better what a film is trying to say is to know how it is saying it. In 1938 or 1939, then, the sound cinema had, especially in France and America, reached a degree of classical perfection that was based both on the maturity of the dramatic genres that had been developed over ten years or inherited from the silent cinema, and on the stabilisation of technical progress. The 1930s saw the arrival of panchromatic film as well as sound. Of course, the studios never stopped trying to improve their equipment, but these improvements were only incidental - none of them opened up radically new possibilities in film direction. Moreover this situation has not changed since 1940, except possibly in the field of photography, thanks to an increase in the sensitivity of film. Panchromatic film upset the balance of values in the image, and ultra-sensitive emulsions allowed modifications to be made in the composition. Now that the director of photography was free to shoot in a studio with a much smaller lens aperture, he could, if necessary, eliminate the blurred backgrounds that used to be the rule. But one can find plenty of examples of depth of focus being employed well before then (by Renoir, for instance); it had always been possible in exteriors and even in the studio with a little ingenuity. It was there to be resorted to if the director so desired. And so what is important here is not so much the technical problem, although the solution of this was considerably facilitated, as the stylistic effect (which I will come back to). In short, ever since the use of panchromatic film and the possibilities offered by the microphone and the crane became general in studios, the technical conditions necessary and sufficient for the creation of film art had been achieved by 1930. As technical requirements played practically no part in this, the signs and the principles of the evolution in language must be sought elsewhere: in the renewal of subject-matter and, in consequence, of the styles that were needed to express it. In 1939, the sound cinema had reached a point which geographers call the line of equilibrium of a river, i.e. that ideal mathematical curve that is the result of sufficient erosion. Once a river attains its line of equilibrium, it flows effortlessly from its source to its mouth without hollowing out its bed further. But if any geological shift occurs which raises the peneplain or alters the altitude of the source, the water becomes active again, penetrating the underlying land, sinking in, undermining, and hollowing out. Occasionally, if there is a bed of limestone, a whole new network of hollows forms on the plateau; it is scarcely perceptible, but is complex and contorted if one follows the way the water takes. 1. General shot taking in both the actor and the table. 2. Tracking shot forward ending in a close-up of his face which expresses a mixture of wonder and desire. 3. A series of close-ups of the food. 4. Back to the character (in medium shot) who walks slowly towards the camera. 5. Slight track back to take in the actor from the knees up, seizing a chicken's wing. 1. Spatial verisimilitude, whereby the position of the character is always determined, even when a close-up cuts out the décor. 2. The intention and effect of this breakdown are exclusively dramatic or psychological. In other words, if this scene were acted on stage and seen from a seat in the stalls, it would have exactly the same meaning; the event would still have an objective existence. The change in camera angles does not add anything, it simply presents reality in the most effective manner. First of all by allowing one to see it better, and then by emphasising what needs emphasising. True, the film director, just like the theatre producer, has a margin of interpretation within which he can inflect the meaning of the action. But this is only a margin, and it cannot modify the formal logic of what takes place. 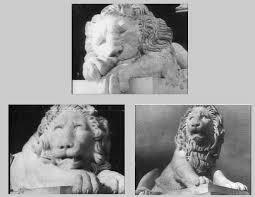 By way of contrast, take the editing of the stone lions in The Battleship Potemkin; skillfully put together, a series of shots of different pieces of sculpture give the impression that one lion (like the people) is getting to its feet. This admirable editing device was unthinkable after 1932. In Fury, Fritz Lang inserted, as late as 1935, a shot of clucking chickens in a farmyard after a series of shots of tittle-tattling women. This was a survival from the age of editing by attraction which brought people up in their seats even at the time and now seems totally out of place in the context of the rest of the film. However marked the art of a director like Carné may be, for instance in his enhancement of the scenerios of Le Quai des brumes (Port of Shadows) and Le Jour se lève, his breakdown of shots remains on the same level as the events it is analysing. It is just a good way of looking at them. This is why we are witnessing the almost complete disappearance of special visual effects, such as superimposition, and even, especially in America, the close-up, which has such a violent physical effect that it makes one aware the director has cut from one shot to another. In the typical American comedy, the director returns as often as he can to a shot of the characters from the knees up (the so-called plan américain), which accords best with the spontaneous attentiveness of the spectator - it is a point of natural equilibrium for his mental accommodation. In fact, this use of editing has its origins in the silent cinema. 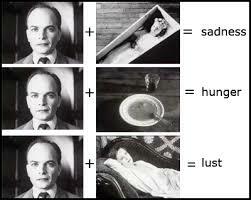 This is more or less the part it plays in Griffith's work, in Broken Blossoms for example; but with Intolerance, Griffith was already beginning to introduce the synthetic conception of editing which the Soviet cinema was to take to its ultimate conclusions and which can be found, less exclusively, in several films at the end of the silent period. Besides, it is understandable that the sound image, being much less malleable than the visual image, made editing more realistic again and to an ever-increasing extent eliminated both plastic expressionism and symbolic relationships between images. And so in about 1938, films were almost always put together according to the same principles.The story was told by a succession of shots, which varied very little in number (around six hundred per film). 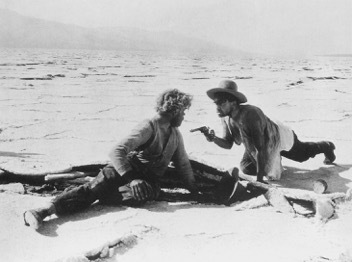 The characteristic technique of this type of narrative was cross-cutting, which, in a dialogue for instance, consists of alternate shots of either speaker according to the logic of the text. This type of shooting script, which perfectly suited the best films of 1930-9, was strongly challenged by the technique of composition in depth used by Orson Welles and William Wyler. The reputation of Citizen Kane is no exaggeration. Thanks to composition in depth, whole scenes are filmed in a single shot (a device known as the plan sequence), sometimes even without the camera moving. The dramatic effects which used to depend on the editing are all obtained here by the movements of the actors within a chosen framing. Welles did not of course 'invent' composition in depth, any more than Griffith did the close-up; all the early pioneers of the cinema used it, and with good reason. The partially blurred image, which came in only with editing, was not simply due to technical subservience resulting from the use of close shots; it was the logical consequence of editing, its plastic equivalent. If at a certain point in the action the director takes for example, as in the imaginary sequence already mentioned, a close-up of a fruit bowl, it is normal for him also to isolate it in space by the focusing of the lens. A blurred background confirms an editing effect. Whereas it is only an accessory part of the style of photography, it is an essential part of the style of the narrative. Jean Renoir understood this perfectly when he wrote in 1938, i.e. after La Bête humain and La Grande illusion (The Grand Illusion) and before Le Regle du jeu (The Rules of the Game): 'The longer I work in my profession, the more I am drawn to mise en scène in depth in relation to the screen; the more I do that, the more I am able to avoid the confrontation of two actors who stand like good boys in front of the camera as though they were at the photographer's.' And in fact if one looks for a precursor to Orson Welles, it is not Louis Lumiere or Zecca but Jean Renoir. In Renoir's work, the tendency to compose the image in depth goes hand in hand with a partial suppression of editing, which is replaced by frequent panning shots and entries into frame. It implies a respect for the continuity of dramatic space and also, of course, for its duration. Anyone who can use his eyes must realise that Welles's plan sequences in The Magnificent Ambersons are by no means the passive 'recording' of an action photographed within a single frame, but that on the contrary this reluctance to break up an event or analyse its dramatic reverberations within time is a positive technique which produces better results than a classical breakdown of shots could ever have done. One needs only to compare two stills which are composed in depth, one from a film of 1910, the other from a film by Welles or Wyler, and one will see just from looking at each still, detached from the film, that their functions are diametrically opposed. The 1910 framing more or less takes up the position of the absent fourth wall of a theatre stage or, out of doors anyway, of the best viewpoint of the action, whereas the sets, the camera angle and the lighting in the second composition have to be looked at with different eyes. Over the surface of the screen, the director and the director of photography have managed to organise a dramatic chessboard from which no detail is excluded. The most obvious, if not the most original, examples of this are to be found in The Little Foxes, where the mise en scène has the precision of a blueprint (with Welles, the baroque overtones make analysis more complicated). The placing of objects in relation to the characters is such that their meaning cannot escape the spectator, a meaning which editing would have built up in a series of successive shots. Take, for instance, a dramatic construction pivoted on three characters in Wyler's The Best Years of Our Lives (the scene where Dana Andrews and Teresa Wright break off their engagement). The sequence takes place in a bar. Fredric March has just persuaded his friend to break off with his daughter and urges him to go and telephone her immediately. Dana Andrews gets up and goes towards the call box which is by the door at the far end of the room. March puts his elbows on the piano in the foreground and pretends to be engrossed in the musical exercises of the disabled sergeant who is learning to play with the hooks he had instead of hands. 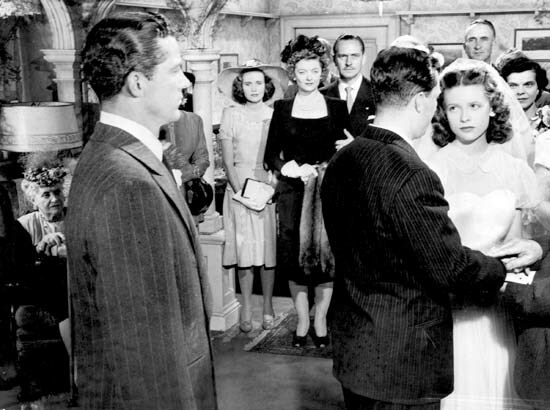 The frame contains the keyboard in close shot, takes in March in close medium shot, includes the whole room, and leaves Dana Andrews quite visible, though small, right at the back of the call box. This shot is clearly governed by two points of dramatic interest and three characters. The action taking place in the foreground is of secondary importance, although interesting and unusual enough to demand our close attention, especially as it occupies a privileged position on the screen and a considerable amount of its surface. The real action, however, the one that at this point constitutes a decisive turning-point in the plot, is taking place almost secretly in a tiny rectangle at the back of the room, i.e. on the very left of the screen. The link between these two dramatic zones is March, who is the only person, apart from the spectator, to know what is going on in the call box, and who, as is logical in such a situation, is also moved by the prowess of his disabled friend. From time to time, March turns his head slightly, and casts an anxious glance diagonally across the screen at Dana Andrews's gesticulations. The latter finally rings off and without looking round abruptly disappears into the street. If we reduce the real action to its elements, it consists basically of a telephone call made by Dana Andrews. The only thing which interests us at this moment is the telephone conversation. The only actor whose face we want to see in close-up is precisely the one whom we cannot distinguish clearly because he is so far away from the camera and behind the glass window of the call box. His words of course cannot be heard. The real drama is taking place in the distance in a kind of small aquarium which lets us see only the banal and ritual gestures of someone telephoning. This idea of the call box at the back of the room which forces the spectator to imagine what is going on inside it, i.e. to share March's anxiety, was in itself an excellent brainwave on the part of the director. But Wyler knew very well that alone it would destroy the spatial and temporal equilibrium of the shot. It had to be both counterbalanced and reinforced. Whence the idea of a diverting action in the foreground, secondary in itself, but whose visual prominence would be in inverse proportion to its dramatic importance. Although a secondary action, it is not an insignificant one; the spectator is also concerned about what will happen to the disabled sergeant and so is interested in what he is doing. And anyway it is certainly not every day that one sees someone play the piano with hooks! Held in suspense and unable really to see at what point Andrews finishes telephoning, spectators are also obliged to divide their attention between the hooks and the call box. In this way, Wyler kills two birds with one stone: the diversion of the piano first of all allows him to hold for as long as necessary a shot which alone would have been interminable and inevitably monotonous, but it is above all the introduction of this pivot of subsidiary action which gives the image its dramatic organisations and quite literally its very construction. The real action is overlaid with the action of the mise en scène itself, which consists of dividing the attention of spectators against their will, of guiding it in the right direction, and thus of making them participate in their own right in the drama created by the director. To be more precise, I should point out that this scene is cut twice by a close shot of March looking at the call box. 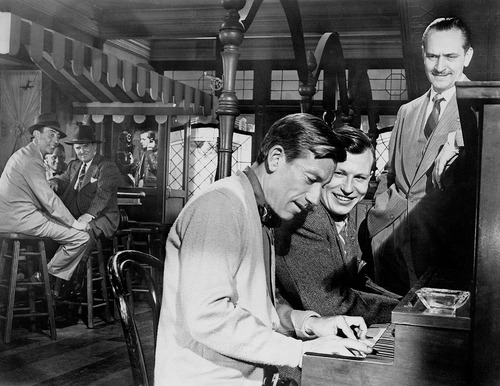 No doubt Wyler was afraid that the spectator would be too fascinated by the piano exercises and might gradually lose interest in the main action, i.e. the dramatic interplay between March and Andrews. The editing probably showed that the two interpolated shots were necessary to recharge the flagging attention of the audience. Such foresight is incidentally very characteristic of Wyler's technique. Welles would have managed to make the call box stand out by its very remoteness and would have held the shot for as long as necessary. For Welles, composition in depth is an aesthetic end in itself; for Wyler, it remains subordinate to the dramatic needs of the mise en scène and especially the clarity of the narrative. The two interpolated shots have the same effect as bold type or a heavily penciled line. Wyler especially likes to construct his mise en scène around the tension created in a shot by the simultaneity of two actions of disparate importance. This can be clearly seen in the still taken from the final sequence of the film. The characters grouped on the right, in the middle ground, seem to form the main dramatic point of interest, as everyone has gathered in this room to attend the wedding of the disabled sergeant. In fact, since this action is a foregone conclusion and, in a sense, already over, the spectator's interest is focused on Wright (in white in the background) and Andrews (on the left in the foreground), who are meeting for the first time since they broke off their engagement. Throughout the whole sequence of the wedding, Wyler manipulates his actors with consummate skill so as gradually to bring to the fore the two protagonists, who, the spectator is sure, are continually thinking of each other. The reproduced still shows an intermediate stage. At this point, the two centers of interest, Andrews and Wright, have not yet come together but the natural though carefully calculated movements of the other actors throw their relationship into clear relief. Wright's white dress, standing out almost in the centre of the frame, makes a kind of dramatic fissure, so that if one were to cut the image in half at the point where the walls meet, the action would also be bisected into its two elements. The two lovers are visually and logically thrust into the left part of the frame. The importance of the direction in which people look should also be noticed in this still. The gaze always forms the skeleton of Wyler’s mise en scène. As well as the actual gaze of the characters, Wyler also excels at getting across to us the virtual gaze of the camera, with which our own eyes identify themselves. Jean Mitry has drawn attention to the low-angle shot in Jezebel which places the lens right in line with Bette Davis’s gaze as she sees the walking-stick that Henry Fonda has in his hand and intends to use. In this way we can follow the gaze of the characters better than if the camera, as in an ordinary shooting script, showed us the stick from above as if through Bette Davis’s own eyes. 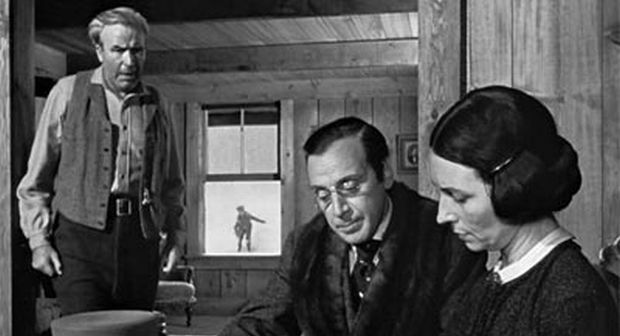 There is a variant of the same principles in The Little Foxes: in order to make us understand the thoughts of the character who notices the small steel box which used to contain some stolen shares (their absence is going to reveal his theft), Wyler puts the object in the foreground, this time with the camera at the same height as the man, but still symmetrically placed in relation to the actor and to what he is looking at. Or gaze does not meet that of the actor directly through the regarded object, but, as through the interplay of a mirror, the angle of incidence of our own gaze on the box is somehow equivalent to the angle of reflection which leads us to the eyes of the actor. In every case, Wyler guides our mental outlook by means of the strict laws of an invisible dramatic perspective. The spectator has only to follow the gaze of the characters like a pointing finger and he will have an exact understanding of all the intentions of the director. If these could be made tangible on the image by a pencil line, we would see, as clearly as we see the ghost of a magnet in iron filings, the dramatic forces which are crossing the screen. All Wyler’s preparatory work consists of simplifying the mechanics of mise en scène as far as possible by making it as efficient and as clear as he can. In The Best Years of Our Lives, he attains an almost abstract purity. Every point of dramatic articulation is so sensitive that a shift of a few degrees in the angle of somebody’s gaze is not only quite obvious to the most obtuse spectator, but is also capable, through a kind of leverage, of turning a whole scene upside-down. The modern director, in using the plan sequence with composition in depth, is not rejecting editing – how could he do so without reverting to a kind of rudimentary gibberish? He is integrating it into his visual style. The narrative of Welles and Wyler is no less explicit than that of Ford, but it has the advantage of not having to forfeit the special effects that can be obtained from the unity of the image in time and space. It matters a great deal (at least in a work that has some style) whether an event is analysed fragment by fragment or shown in its physical unity. It would of course be absurd to deny the marked progress in film language that has been brought about by the use of editing, but it has been gained at the expense of other qualities that are no less specifically cinematic. This is why composition in depth is not just another cameraman’s device, like the use of filters or of a certain type of lighting; it is a vital contribution to mise en scène: a dialectical advance in the history of film language. And this advance is not merely a formal one. Composition in depth, well used, is not just a more economical, subtle and simple way of heightening an event; it affects not only the structure of film language but also the intellectual relationship between the spectator and the image, thus actually modifying the meaning of the film. 1. Composition in depth means that the spectators’ relationship with the image is nearer to that which they have with reality. It is then true to say that quite independently of the actual content of the image its structure is more realistic. 2. Consequently, composition in depth demands a more active mental attitude on the part of spectators and even a positive contribution to the direction. Whereas with analytical editing they have only to follow their guide and let their attention focus on whatever the director has chosen for them to see, a certain minimum of personal choice is required here. The fact that the image has a meaning depends partly on their attention and their will. 3. From the two proceeding propositions, which are of a psychological nature, there follows a third one which might be defined as metaphysical. By analyzing reality, the very nature of editing assumes the dramatic event to have a unity of meaning. Another analytical process might be possible, but the result would be a different film. In short, the nature and essence of editing is such that it stands in the way of the expression of ambiguity. And it was precisely this that was proved by Kuleshov’s reductio ad absurdum: each time, an exact meaning was given to the face whose ambiguity made possible these three alternately exclusive interpretations. Composition in depth, on the other hand, brings ambiguity back into the structure of the image; this is not automatic (Wyler’s films are hardly ambiguous at all), but it is certainly a possibility. That is why it is no exaggeration to say that Citizen Kane is conceived entirely in terms of composition in depth. One’s uncertainty about the spiritual key or interpretation of the film hangs on the very composition of the image. It is not that Welles purposely refrains from using expressionist editing techniques. In fact, their episodic use, in between plans séquences with composition in depth, gives them new meaning. Editing had once been the very stuff of cinema, the tissue of a scenario. In Citizen Kane, a series of superimpositions stands in contrast to the continuity of a scene taken in a single shot; it is a different, explicitly abstract register of the narrative. Accelerated editing used to distort time and space; Welles’s editing, far from attempting to deceive us, offers us a temporal résumé – the equivalent, for example, of the French imperfect tense or the English frequentative. And so ‘quick editing’, ‘editing by attraction’ and the superimpositions which the sound cinema had not resorted to for ten years found a possible use in conjunction with the temporal realism of cinema without editing. I have dwelt on the case of Welles because the date of his appearance in the cinematic firmament marks the beginning of a new period, and also because his case is the most spectacular and significant in its very excesses. But Citizen Kane fits into a general movement, into a vast geological shift of strata which, in one way and another, confirms this revolution in expression. Confirmation along different lines can be found in the Italian cinema. 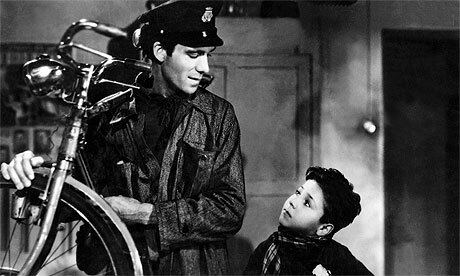 In Roberto Rossellini’s Paisà and Germania, anno zero (Germany, Year Zero) and Vittorio De Sica’s Ladri di biciclette (Bicycle Thieves), Italian neo-realism stands in contrast to previous forms of cinematic realism by its elimination of any expression and especially by the total absence of effects obtained by editing. Just as in Welles’s work (and despite their very different styles), neo-realism tends to give a film the feeling of the ambiguity of reality. The way Rossellini looks at the child’s face in Germania, anno zero is at opposite poles to Kuleshov’s attitude to the close-up of Mozhukhin; he wants to preserve its mystery. One should not be put on the wrong track by the fact that the evolution of neo-realism does not at first sight seem, as in America, to consist of some revolution in the technique of breaking down shots in a shooting script. There are various means of achieving the same end. Rossellini’s and De Sica’s are not so very spectacular, but they too aim at eliminating editing and transferring on to the screen the true continuity of reality. It is Cesare Zavattini’s dream simply to film ninety consecutive minutes in the life of a man to whom nothing important happens! Luchino Visconti, the ‘aesthete’ of the neo-realists, revealed just as clearly as Welles the fundamental aim of his art in La terra trema, a film that is almost entirely composed of plans sequences where the desire to take in the totality of an event can be seen in the composition in depth and the endless panning shots. But we could not possibly examine all the films which have contributed to this linguistic evolution since 1940. It is time to draw some conclusions from what I have said. The last ten years have, I think, shown a marked progress in the field of cinematic expression. I deliberately neglected, from 1930 on, the tendency of the silent cinema that was particularly evident in the work of Stroheim, Murnau, Flaherty and Dreyer; but I do not think it died out with the coming of sound. On the contrary, I am sure it was the most fertile aspect of the so-called silent cinema, and the only one which, precisely because the essence of its aesthetic conception was not bound up with editing, called for the realism of sound as its natural expression. But it is true that the sound cinema from 1930 to 1940 owes almost nothing to it, apart from the notable and, in retrospect, prophetic exception of Renoir, the only director who consistently attempted in his films up to La Règle du jeu to rise above facile editing effects and seize the secret of a cinematic style which was capable of expressing everything without fragmenting the world, of revealing the hidden meaning of human beings and their environment without destroying the natural unity. However, it would be out of the question to throw discredit on the cinema of the 1930s (in any case, this would not stand up to the evidence of several masterpieces). My purpose is simply to suggest a notion of dialectical progress, the turning-point of which took place in the 1940s. It is true that the arrival of sound proved fatal to a certain aesthetic approach to film language, but this was an approach that was leading it farthest away from its vocation for realism. The sound cinema did however retain the essential function of editing: discontinuous description and dramatic analysis of an event. It rejected the metaphor and the symbol, and aimed instead at an illusion of objective representation. Expressionist editing almost completely disappeared, but the relative realism of that narrative style which was the general rule in 1937 contained a congenital limitation of which we could not at the time have been aware, so perfectly appropriate to it were the subjects that were treated. This was true in the case of American comedy, which reached perfection within the framework of a narrative where temporal realism played no part. Essentially logical, like vaudeville and punning, perfectly conventional in its moral and sociological content, American comedy had nothing to gain from descriptive and linear precision or from the rhythmic resources of the classical narrative style. It is above all in the direction taken by Stroheim and Murnau, almost entirely neglected in the 1930s, that the cinema has been veering more or less consciously in the last ten years. But directors are not confining themselves to prolonging it; they are deriving from it the secret of a realistic regeneration of the narrative. The narrative is again becoming capable of reintegrating the temporal truth of things, the actual duration of an event which the classical narrative insidiously replaced with intellectual and abstract time. But far from eliminating the achievements of editing once and for all, modern film-makers are giving them a relativity and a meaning. It is only when related to an increased realism in the image that extra abstraction becomes possible. The stylistic repertory of a director such as Hitchcock, for example, stretches from the powers of the documentary image to superimpositions and extreme close-ups. 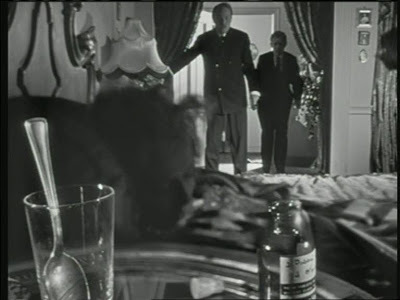 But Hitchcock’s close-ups are not the same as those of Cecil B. DeMille in The Cheat. They are just one stylistic device among others. In other words, in the silent era, the editing evoked what the director wanted to say, in 1938 the narrative described, and today one can say that the director writes directly in film. The image – its visual structure and its organization within time – because it can now draw on greater realism, has more means at its disposal of inflecting and modifying reality from within. The film-maker is no longer simply the competitor of the painter or the playwright; he is at last the equal of the novelist.